The Trapezium. The brightest star is Theta1 Orionis C. Credit: John Bally, Dave Devine, and Ralph Sutherland, STScI, NASA. Trapezium (Theta1Orionis) is a star cluster at the heart of the Orion Nebula consisting of more than 1,000 young stars crowded into a space about four light-years in diameter (roughly the distance between the Sun and the next nearest star). A few of these stars are hot O and B stars. The majority, however, are later-type, cooler, less luminous, and less massive pre-main sequence stars of a solar mass or less. With an average stellar age of only one million years, the Trapezium is one of the youngest clusters known. Most of its member stars are hidden by dust or by the glare of the nebula but are visible at infrared wavelengths. 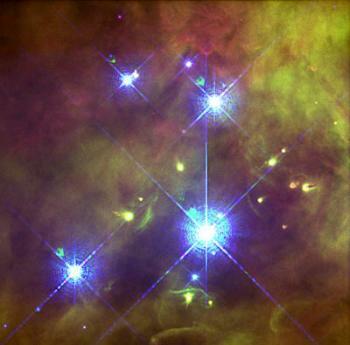 The four brightest stars (A, B, C, and D), which form the vertices of a trapezium and give the cluster its name, can be seen easily with a small telescope. Two fainter stars of eleventh magnitude, E and F, show up in moderately sized amateur instruments under good seeing conditions. A further two, of 16th magnitude, G and H, are only visible in very large amateur scopes. Theta1 Orionis A, also known as V1016, is an eclipsing binary with a period of 65.432 days and a magnitude range of 6.72 to 7.65. Theta1 B, also known as BM Orionis, is another eclipsing binary, spectral type B2-B3, with a period of 6.471 days and a magnitude range of 7.90 to 8.65. An infrared companion has also been discovered in the Theta1 A system, making it a triple star, and Theta1 B is now known to be a quadruple system, with three components detected separately in the near-infrared. Infrared observations have that shown Theta1 C, which is actually the brightest star in the cluster, is a close binary as well.